Built on an ancient trade route, the Boudhanath Stupa is the hoiliest of Buddhist sites in Nepal and is frequented by many Tibetan Monks, local Buddhists who fled Tibet when the Chinese invaded in 1959 and of course, Tourists. It is also the largest of it's kind in the World. It is approx. 700 years old. The entrance to the Stupa is through a small gateway off Boudha Road. If you are parked on the other side of the road to the entrance beware, it is VERY busy! The Stupa itself is surrounded by a traffic free 'roadway' in which there are many Shops and Guest Houses plus Monasteries in quite splendid buildings. Like other Buddhist sites the Stupa and it's surroundings are steeped with Prayer Flags, the combination of the wind blowing them and the sounds of Buddhist music makes for a really enjoyable experience. When I first entered through the gateway I couldn't but help feeling a sense of happiness, it was along with the flags and music, in the air. 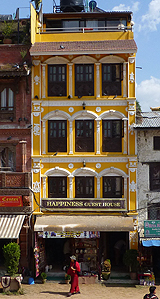 This was physically confirmed to me when I saw a Hotel on the far side aptly named 'The Happiness Guest House'. I reckon the Guests get what it says on the tin ! Most of the locals and Monks just seem to spend their time walking around and around the Stupa many times, some touching the Prayer Drums as they go, the famous red of their robes also makes up a very colourful sight. As with all Temples, Squares and Gardens in Kathmandu it isn't just about going there, getting the photos and leaving, it's about taking time out, sitting down and just observing what's going on around you. As I said, I felt good in this place. It would seem the 700 years or so of visitations and pilgrimages has indeed left it's mark.